Brisport ran principally on opposition to a plan to turn a publicly owned armory building that covers an entire city block into luxury housing, arguing that it should be used for low-income housing and facilities for the community. He called for converting the property to a community land trust. He took up the position of the Crown Heights Tenants Union, which had opposed the deal. His opponent Cumbo had supported the armory deal until public turned against it, as manifest in the spread of “Kill the Deal” signs in local home and store windows. While Cumbo, under pressure, later came out against the armory deal, many doubted her sincerity and had no confidence in her actual commitment to resist it. Shortly before the election, Jabari was arrested after he and other housing acivists disrupted a City Planning Commission meeting that voted 11-1 in favor of the plan to turn the publicly owned property into a private development of luxury apartments. While housing was the big issue, Jabari also defended public education against charter schools, supported Black Lives Matter and called for criminal justice reform, as well as speaking out for climate justice. DSA, which has over 1,000 members in Brooklyn, mobilized its members to support Brisport’s campaign. Jabari won the Green Party primary election, while DSA circulated petitions and won enough signatures to put a Socialist line on the ballot. Jabari’s was one of two campaigns supported by Brooklyn DSA in the last few months. In the Democratic Party primaries, DSA had supported Rev. Khader El-Yateem an Arab-American Lutheran minister and community organizer. Born in Bethlehem, Palestine in 1962, El-Yateem migrated to the United States in 1992 and settled in Bay Ridge, Brooklyn in 1995. While he ran primarily on local community issues, El-Yateem also took controversial stands on broader political questions, such as his vocal support for the Boycott, Divestment and Sanctions Movement against Israel, known as BDS. In the District 43 Democratic primaries, El-Yateem, also a DSA member, received 31 percent of the vote, while Justin Brannan won with about 39 percent, other candidates dividing the rest. For many years DSA principally worked within the Democratic Party and supported its candidates and didn’t expect or ask candidates to run as socialists. These two races give expression to DSA’s new approach to politics, willing to support both progressive Democratic Party candidates, especially if they run as open socialists, but also independent, Green Party or socialist candidates. The race also demonstrates DSA’s desire to link politics to the building of social movements, such as the fight for decent housing and against Islamophobia. DSA’s political approach has put them at odds both not only with some progressive Democrats and also with the Working Families Party. The WFP did not support either El-Yateem in the primary or Brisport in the general election. We will seeing more such candidacies backed by DSA in New York City and other areas of the country. *Dan La Botz is a Co-Editor of New Politics. He was the Socialist Party USA candidate for the U.S. Senate in Ohio in 2010. He worked as a volunteer in the Jabari Brisport campaign for NYC City Council. 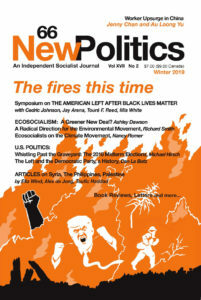 ‹ Is Socialist Revolution Possible – Or Even Necessary?